After some very tough years, the Saskatchewan forest industry is starting to come back to life, following a reallocation of the forest resource. But not everyone is happy with the end result. In an exclusive interview with Logging and Sawmilling Journal, West Fraser Timber CEO Hank Ketchum talks about the company’s $230 million mill capital investment program, and the growth in the Chinese lumber market. The Baker Boys in Alberta know what it takes to survive as a logging operation—and they’ve evolved and adapted with their logging equipment to stay ahead of the curve, and meet customer needs. Tolko’s Quest Wood Division in Quesnel, B.C. has made an investment in two Liebherr 934 C machines, which is allowing them to stack logs higher—and ended the need for satellite log storage yards. A resilient Manning Diversified Forest Products has toughed out the downturn in lumber markets, but the company believes the real opportunity going forward could be in bio-energy, which would help Alberta’s forest industry to be more competitive. What started out as a small sawmilling operation in Nova Scotia has since grown, and is now turning out product for the broader Canadian market—with sights set on the U.S., European and Asian markets. 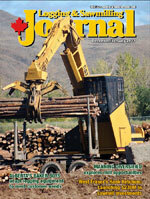 Logging and Sawmilling Journal has the latest equipment information on grapples in this issue’s Tech Update. Tony Kryzanowski says it’s time for Canada to stop waiting for the U.S.— and that is should go its own way on the environment. 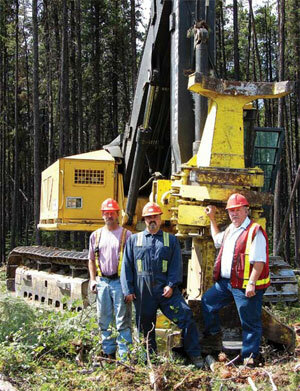 The Baker Boys in Alberta know what it takes to survive as a logging operation--and they've evolved and adapted with their logging equipment to stay ahead of the curve, and meet customer needs. Ken Baker remembers when there were about nine logging contractors in Hinton, Alberta. Now, he can only recall only three or four. That's a reflection of the life and times in today's forest industry. But like many contractors, he's thinking maybe the industry has turned the corner. Baker owns Echo Logging with brother, Cody, along with their wives, Karen and Stacey. They are a stump-to-dump logging contractor, harvesting about 180,000 cubic metres of softwood annually for West Fraser Timber in Hinton. by West Fraser Timber in 2004) built all the roads and landings on their area cutblocks and harvested all the wood, including the cedar, which they didn't want and often left behind. Cariboo Cedar acquired that wood and built a forest company around it. "That's how dad and I got started," says Ken, "skidding the cedar in behind Weldwood." When Cariboo Cedar ran into financial difficulty, the next stop for the Bakers was Lillooet, B.C., for 13 years. There, they worked for Evans Forest Products, which later became part of Ainsworth Lumber. "When we first started out, it was all hand falling with chainsaws with line skidders, and on the side of a mountain that was up to 70 per cent grade." says Ken. "You could put skid trails on a side of a mountain back then. Not any more." While it all seems like ancient history now, "the very first piece of mechanized equipment we had was a snipper on the front of a Cat," says Cody. "It was a shear and it just cut the tree and the tree fell over." The company took a contract in Hinton in 1990, and has been there ever since. Cody bought his dad out in 1992. 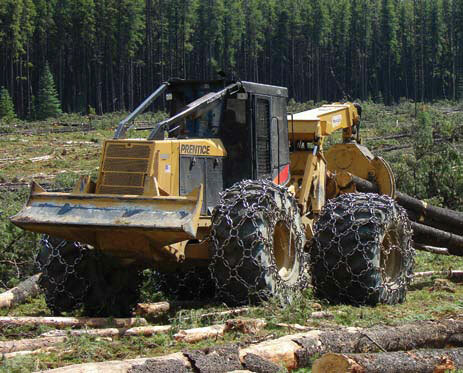 Echo Logging recently made the transition back to conventional logging using skidders and feller bunchers as one way to help West Fraser Timber in Hinton lower logging expenses in a challenging economy. During its 35 year journey, Echo Logging has survived just about everything the industry could throw at it, including numerous ownership changes over several decades at the Hinton sawmill and pulp mill. 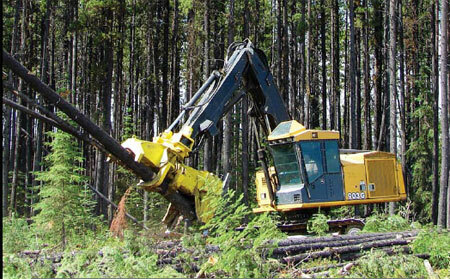 By the time they settled in Alberta, Echo Logging was a totally mechanized operation. Later, that would include a stint heavily invested into highly advanced, multi-functional, cut-to-length (CTL) equipment with harvester/processors and logs delivered to roadside with forwarders. The reason for this approach was to leave the cones and debris in the cutblock, to encourage natural regeneration and to avoid having to burn brush piles. "It's an expensive way to log, but I quite prefer it," says Cody. "Environmentally, it's a lot easier on the ground, especially when it is wet, but wood size really affected the production of the harvesters." 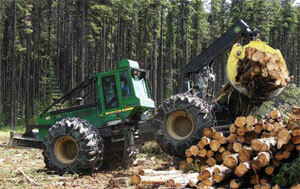 Most of their equipment at that time was Timberjack, which was later acquired by John Deere. "It was a whole new way of logging and it took us about three years to get a handle on it," says Ken. Just as they had learned how to maximize production from that system, the industry took a severe downturn. And like other forest companies, West Fraser Timber was doing everything possible to operate as efficiently as possible. After making the switch to CTL in 2000, Echo Logging experienced what most loggers would consider their worst nightmare. They were notified in 2007 that they'd be required to switch back to conventional harvesting, using feller bunchers, skidders, and processors at roadside, at a time when CTL iron was garnering just about as much interest on the auction block as a bag of hockey pucks. Meanwhile, they were still making payments on it. What contributed to the switch back to conventional logging is that in 2006, the pulp mill closed its wood room. "That was a very painful changeover and at the worst time--right when things were going downhill," says Cody. But Echo Logging managed to stay in business. Cody and Ken Baker (centre and right) have managed their business with the philosophy that if they treat their employees well, they'll stick around. The company also has a number of family members involved, including feller buncher operator Darcy Stone (left), Ken's brother-in-law. Their current fleet consists of a John Deere 903J feller buncher, a John Deere 903G feller buncher, and a larger John Deere 953G feller buncher. Their skidders are a John Deere 748 GIII and a Prentice 490. Loaders are a Komatsu 300 HD-5 and Komatsu 300 HD-6. They have two crawler dozers, a Komatsu D85 and a Komatsu D65. Rounding out the fleet is a Komatsu PC 250 excavator. Not only did Echo Logging's iron have to change, but their sub-contractor logging truck configurations had to change as well. Despite this transition, the company was happy it was able to maintain its relationship with West Fraser while other contractors were being let go. Not only did the bottom drop out of the softwood lumber market, but shutting down the wood room at the pulp mill reduced the need for about 600,000 cubic metres of fibre and about three logging contractors. Because the CTL equipment was worth so little, the company converted a Timberjack 1710 forwarder into a clambunk for skidding tree length logs to roadside. It's been a tough road, but the Bakers say the fact they are a family-run operation has really helped pay the bills. The owners now spend considerably more time back in the cab operating the equipment, a cost saving measure over the past couple of seasons. "I stepped back in the buncher because it didn't make sense to hire somebody while I'm still drawing wages," says Ken. The volume also didn't warrant hiring extra employees. Brother Pat sub-contracts his Prentice 490 skidder to Echo Logging, and has been sub-contracting to the company since he finished high school. Ken's brother-in-law, Darcy Stone, is a feller buncher operator, and has worked for the company for 10 years. Cody's brother-in-law, Ron Peterson, is another feller buncher operator. After starting with the company, he sampled the oilfield for a time before returning to the family business. The company has a total of 15 employees. Long time loader operator, Jimmy Johnson, has been with them for 34 years and Cat operator, Jake Teichroeb, for 15 years. The owners recently agreed to help a younger, long-term delimber and loader operator, Dwight Bohn, make the move from employee to sub-contractor. He has brought a John Deere 2054 carrier with a Waratah 622B head into the mix. He provides Echo Logging with a sub-contractor with considerable industry experience whose livelihood depends on quality and production, in an environment where good processor operators are hard to find. It also offers Bohn an opportunity to profit from the industry with more than just a paycheque. In addition to his John Deere and Waratah processor package, he also purchased a Komatsu PC 250 carrier with a LogMax 7000 processing head and Komatsu PC 200 with Log Max 5000 processing head from Echo Logging to expand his fleet. "Processors are a high maintenance machine and if you don't get a good operator on them, they can cost you a lot of money," says Ken. "After a guy has been in the bush for so long working for wages, if they want to stay in the bush, they want to get into their own piece of equipment. We've helped more than one guy out that way. A good operator is worth backing and keep around." Echo Logging works with a couple of sub-contractors, including Cody and Ken Baker's brother, Pat, who has worked as a skidder sub-contractor to the company for 30 years. At present, he operates a Prentice 490 skidder (left). Echo Logging has also worked hard to keep its iron working longer through regular maintenance, once again demonstrating that equipment suppliers are manufacturing more durable equipment with a longer shelf life. With so much riding on equipment uptime, the company has benefited in that Cody is a heavy-duty mechanic with decades of on the job experience. He says he does about 99 per cent of the wrenching and welding himself. The harvesting focus now is on larger, more mature pine as a way to curb the movement eastward of the mountain pine beetle. It has also affected the log haul as West Fraser has stipulated that logs can not be hauled from identified infested areas unless it is less than 18 degrees Celsius, because below that temperature, the beetle won't take flight and spread into unaffected cutblocks. The average diameter of the logs over the years has been in the 10" to 15" range. At present, Echo Logging is producing considerable tree length material with two sorts, the break point being at 10" diameter. The terrain varies, as the company logs primarily in the Rocky Mountain foothills. Grades can reach up to 40 per cent. They also log in sensitive Grizzly bear habitat and while generally not a major influence on operations, logging activity must be shut down immediately and the company biologist called in if they encounter anything resembling a bear den. Ken says he has never seen the industry in such a weak state, but there are new opportunities for contractors evolving, such as growing demand for biomass for power generation and other non-traditional forest products. He expects as companies invest in these new facilities that some contractors will expand their operations to include biomass procurement and processing as a way to diversify their own operations.